I knew who John Moray was. His famous 1889 panoramic lithograph of Berkeley Springs can be found on local walls, notecards and online. The most recent limited edition was reprinted and sold by the Chamber of Commerce. It may be Berkeley Springs’ most durable piece of art. In my marathon newspaper reading ( “The News” – 1870 through 1939 on microfilm) I had discovered more about him and his work. And then, in the search of historic photos that is Images, I found a Moray worthy of turning into a Museum exhibit. John Moray was an artist, sign painter and photographer who apparently wanted to do his part in spreading the word about Berkeley Springs. He was a photographer when he arrived from Rome, Pennsylvania in 1885 and was first mentioned in The News where he advertised himself available for sign painting or picture enlarging. He worked with glass negatives. The News reported in September 1887 that Moray was busy taking pictures of prominent places in the town and county. By April 1889, he had turned these images into the now legendary Moray Print. In his later years, Moray became a devotee of James Rumsey and was instrumental in creating and placing the Rumsey millstone monument in the park. Back to the present and the fascinating unearthing of both photos and stories. The Mendenhalls were a prominent and wealthy family in Berkeley Springs with a homeplace in Sir Johns Run. Their brick house on Wilkes St., built in 1884, has been restored and is on the National Register. 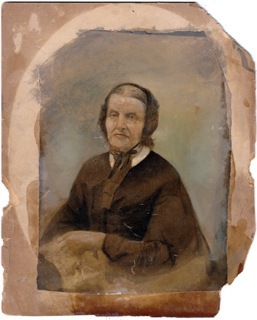 When I saw the roughly treated image of the older woman in a box of stuff at the Museum, I knew it was a painted photograph and immediately thought of Moray. Then I turned it over and saw the writing: John Moray, 1887 of Mrs. Mendenhall. I had my suspicions confirmed by a couple folks who agreed it was a photograph that had been painted. Then, I found the tiny photo in a metal case common to the Victorian era. It was the same woman. The same pose. Must have been one of the “enlargings” he mentioned in his ad. Ma’am: John Moray did the 1881 Waverly NY mural/lithograph/photograph that’s on eBay, and well known throughout the “Valley” (Waverly NY – Sayre and Athens PA). This mural was first sold Thanksgiving – Christmas 1881 by drugstores in the named towns. I don’t know anything else about the man, just you;’ve popped up in a Dogpile search, as nothing but your contribution to Joyce Tice’s website.